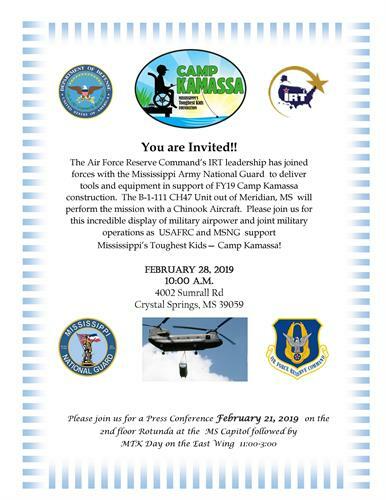 MTK Camp Kamassa Air Drop Invitation - Feb 28, 2019 - Oxford Mississippi ? Mississippi's Toughest Kids Foundation (MTK) is building Camp Kamassa, Mississippi's first year-round fully handicap accessible camp facility for children and adults with serious illnesses, physical and mental challenges, and other special needs. MTK has partnered with the Department of Defense's Innovative Readiness Training (IRT) Program. The IRT partners with communities on projects that build military readiness for deployments. The IRT is assisting with labor for the construction of Camp Kamassa in return for military training opportunities. The Air Force Reserves have taken the lead on the project. It's a win win for MTK and the IRT! In preparation for the work the IRT will be doing in 2019, we are planning an Air Drop of the tool kits to the troops. A MSARNG Chinook aircraft will drop the massive tool kits onto the Camp Kamassa construction sight as spectators look on. It will be a spectacular event!